Synopsis: Two grave-robbers enter the family crypt of the wealthy Talbot family, looking for an expensive watch and ring left on the body of young Lawrence Talbot, a.k.a. the titular Wolf Man. As the full Moon peeks through the windows, the thieves are puzzled to find Talbot’s body covered with wolfsbane. They clear it off and begin searching for the ring. Suddenly, a hand reaches up from the coffin to grab one of the unfortunate thieves…. Later, a Cardiff policeman finds a man lying unconscious on the street in the dead of night, the apparent victim of an assault. At the hospital the next day, Dr. Mannering is shocked to discover that his patient — on whom he had just operated hours earlier — is now conscious and talking. The man says he is Lawrence Talbot and does not know how he came to be in Cardiff. Checking Talbot’s story, the police discover that Lawrence died four years earlier. That night, the full Moon rises over the hospital, and Lawrence changes into a werewolf. He takes to the streets of Cardiff, attacking a policeman. The next morning, Talbot declares that he committed a murder during the night and asks for the police. Thinking the man has lost his marbles, Dr. Mannering has him put in a straitjacket. He then goes with the local chief of police to the Talbot family crypt, trying to determine if the man in his hospital room is really Talbot; sure enough, they find the coffin empty. When he returns to Cardiff he finds that Talbot has somehow shredded the straitjacket with his teeth and escaped. After a long search Talbot finally catches up with the Gypsy camp of Maleva. Talbot knows that death is the only way he can be free of the curse, but Maleva tells him the only chance he has to die is to visit the guy who has harnessed the powers of life and death: the notorious Dr. Frankenstein. The two travel by horse-drawn wagon to Vasaria, the hometown of Dr. Frankenstein.Disappointed to find that Dr. Frankenstein is long dead, Talbot and Maleva decide to look around the ruins of the castle in hopes of finding Dr. Frankenstein’s diary, which purportedly holds “the secrets of life and death”. Alas, a full Moon rises (again), Talbot turns into the Wolf Man (again), wreaks a good deal of havoc, falls through an opening near the castle and awakens (as Talbot again) in an icy underground chamber adjacent to the castle, where he finds Frankenstein’s monster, frozen like a TV dinner…. Comments: We’re seeing a definite trend in Horror Incorporated’s Friday night entries: the Universal classics are getting a pretty snazzy showcase in the 8pm timeslot. And it’s a good thing — tonight’s film, Frankenstein Meets the Wolf Man, hasn’t been broadcast on the show for a couple of years. So I’d say we’re overdue. By modern standards, the horror films of the 1940s unfolded at what we might charitably call a leisurely pace. Audiences had long been trained to expect movies to build slowly, with the big action set-pieces saved until the finale. 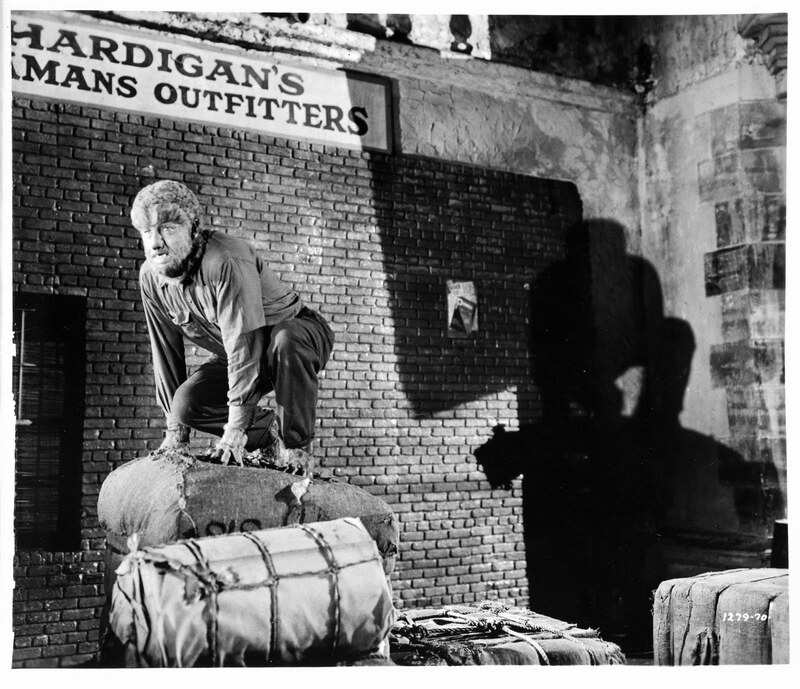 This was true even in best-known pictures of the time, including 1941’s The Wolf Man. He asks his partner in crime what they will find inside the coffin. “Just bones,” the older thief assures him, “and an empty skull”. But that isn’t what they find. Beneath a layer of wolfsbane is young Talbot, his body perfectly preserved — and now the light of the full Moon is shining through the windows onto his face. For some reason this doesn’t strike the thieves as odd, and they work to pull the gold ring off Larry Talbot’s finger. But the brains of the outfit is more than a little surprised when Talbot’s hand seizes his wrist, and he screams to his compatriot for help. But the other thief panics and runs for his life. The scene shifts to Cardiff, where a cop walking the beat finds a man sprawled on the pavement. Thinking it’s a drunk, the cop tries to rouse him, but when he shines his flashlight on the man’s face he sees an ugly cut on the guy’s forehead. This scene leads directly to St. Mary’s Hospital, where the injured man claims to be the late Lawrence Talbot. The mystery of who he is and how he came to be in Cardiff then propels the movie forward until the next full Moon, when the usual lycanthopic hijinks ensue. 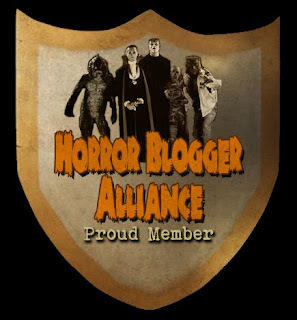 The events that propel the plot forward are much stronger than those in The Wolf Man or indeed any of the Universal horror films of the era. Curt Siodmak’s screenplay is expertly paced and in spite of some glaring plot holes (why would Dr. Mannering follow Talbot all the way to Vasaria?) it’s really one of the best horror scripts of the 1940s. Siodmak, who was by all accounts a crass and hackish sort of fellow, did remarkably good work during this period of his career. Perhaps his personal best was the 1942 novel Donovan’s Brain, which was adapted as a radio play and, a decade later, as a well-regarded film. Unfortunately, Siodmak would essentially recycle the same story for the rest of his career. 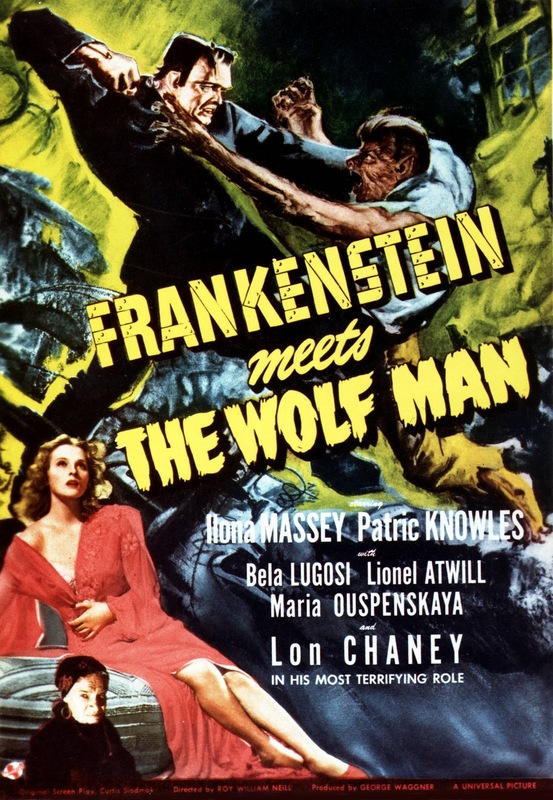 In a lot of ways, Frankenstein Meets the Wolf Man anticipated the sort of crossover films that are common today: the idea of Frankenstein’s monster and the Wolf Man inhabiting the same universe must have seemed quite novel at the time, especially since one character is rooted in science-fiction tropes, while the other has occult origins. But the result is quite pleasing, and it wasn’t long before all the characters in the Universal monster pantheon were thrown together — first for dramatic effect in the monster rallies, and later for more comedic purposes in the Abbot and Costello films, where the monsters fit in surprisingly well amidst the hijinks of Bud and Lou. I was quite familiar with this sequel growing up, and was delighted to see the 1941 Wolf Man on the farewell Chiller Theater broadcast of December 31, 1983, preceding second feature IT CAME FROM OUTER SPACE.